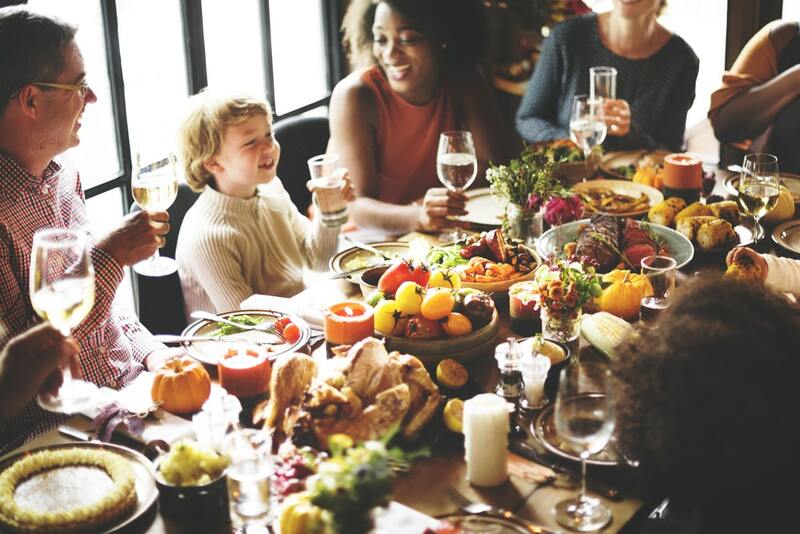 As we all gather around the dinner table this Thursday, we’ll say our thanks for the things in life that we hold most dear: our friends, our family, and our good health. If you’re Team Basket, you’ll also say a big thank you for our community of smart shoppers, grocery store price comparison, and for cheap, delicious recipes. It’s a common misconception that Thanksgiving dinners need to break the bank. Brimming with hearty sides and savory flavors, we understand where some could draw that conclusion. But, what if we told you that Thanksgiving doesn’t need to cost an arm and a leg? Keep all your limbs – and your budget! – intact when you follow our Thanksgiving Basket Budget Menu. Everyone knows that it’s the sides that make Thanksgiving dinner so memorable (and tasty). Today, we’ll be sharing three easy-to-make side dish options that won’t break the bank. Using fresh ingredients and pantry-staples, these easy side dish recipes might just steal the show! 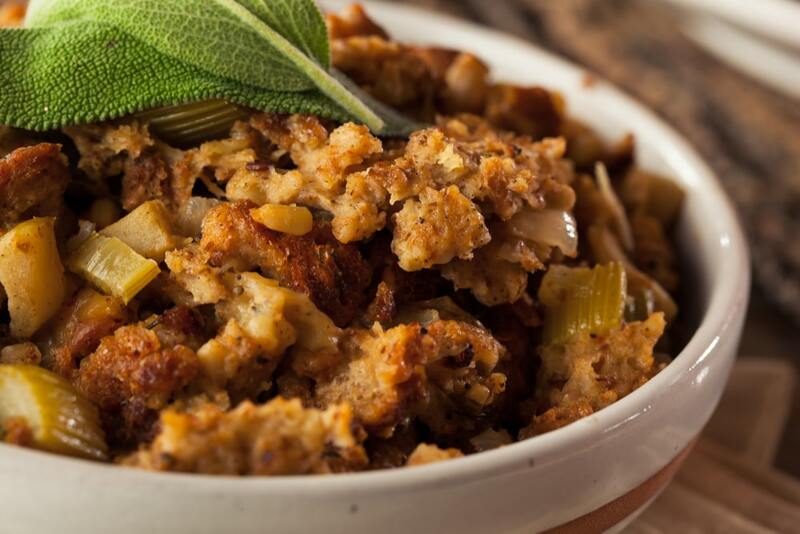 You can’t do Thanksgiving without the stuffing – it’s a law (at least it is to us). While we love the ease and price of stuffing mixes, we also love that homemade taste that you can only achieve by putting in some TLC. So, check out this simple way to doctor up your stuffing! Heat the broth or water, celery, and onion in a 2-quart saucepan over medium-high heat until it reaches a boil. Reduce the heat to low and cover. Cook for 5 minutes, or until the vegetables are tender. Then, remove the saucepan from the heat. Next, place stuffing mix in a 15″ by 10″ pan. Gradually add your hot mixture, stirring lightly. Once all liquid has been added, fold in chopped walnuts for a fun crunch. Serve hot and enjoy! During the madness of Thanksgiving, oven space becomes precious. When you feel like you’re running out of racks in the oven, turn to every chef’s best friend: the slow-cooker! 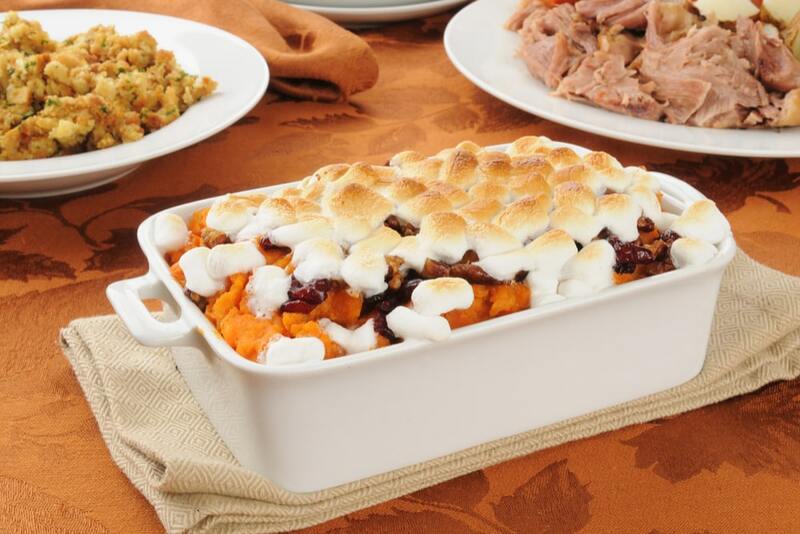 This family-favorite dish offers a heaping serving of sweet potato while tiding your sweet tooth over until dessert. With a 20-minute prep time, you can throw these ingredients together quickly. Then, set them and forget them for the next 4 hours while you buzz about the kitchen. Begin the prep for this scrumptious dish by spraying your slow-cooker with cooking spray. Next, in a microwavable bowl, mix salt, sugar, butter, pumpkin pie spice, and water. Microwave uncovered on high for 1.5 minutes, stopping once to stir. Remove and stir in vanilla. Add the diced sweet potatoes in the slow-cooker, pouring the vanilla mixture over top and stirring lightly to coat thoroughly. Cover and cook on the high heat setting for 3.5 to 4 hours, or until fork tender. Reduce to warm until ready to serve. Just before you gather the gang to the table, give the mixture another stir and top with marshmallows. Cover for another one to two minutes, or until marshmallows melt slightly. Then, eat fast! This dish calls for seconds, thirds, and even fourths! No Thanksgiving would be complete without the greens. This 6-ingredient, 15-minute recipe is the veggie side dish you won’t need to convince the kids to eat. Easy to throw together with ingredients you likely already have sitting in your pantry, your budget and your time schedule will thank you for this one. Begin by heating the olive oil over medium-high heat in a large skillet. Add garlic and cook for 1 minute, stirring frequently. Next, add the green beans, black pepper, and sea salt. 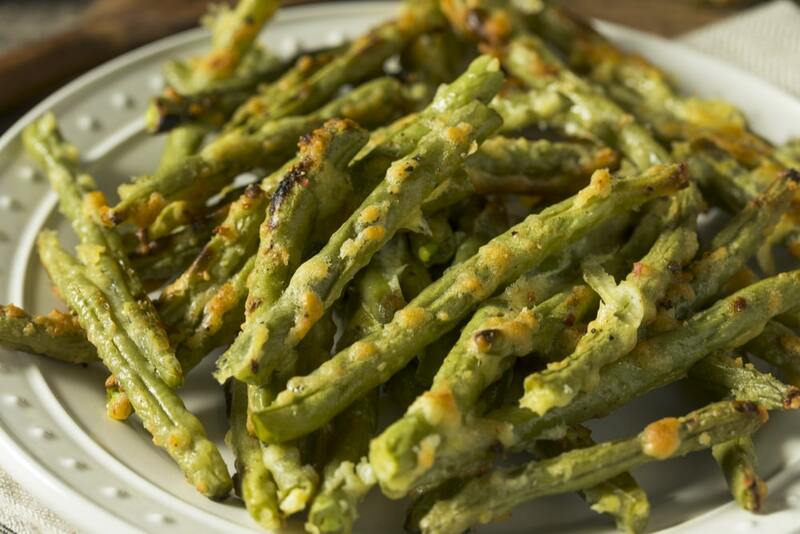 Toss to coat the green beans evenly. Continue to saute for 5 to 6 minutes, stirring occasionally. Remove from heat and sprinkle with grated Parmesan. Toss once more to melt Parmesan, and serve hot. This Thanksgiving Budget Menu wouldn’t be complete without a turkey. But, Thanksgiving turkeys are the bane of many home chef’s existences. Prepare to make Thanksgiving turkeys easy. 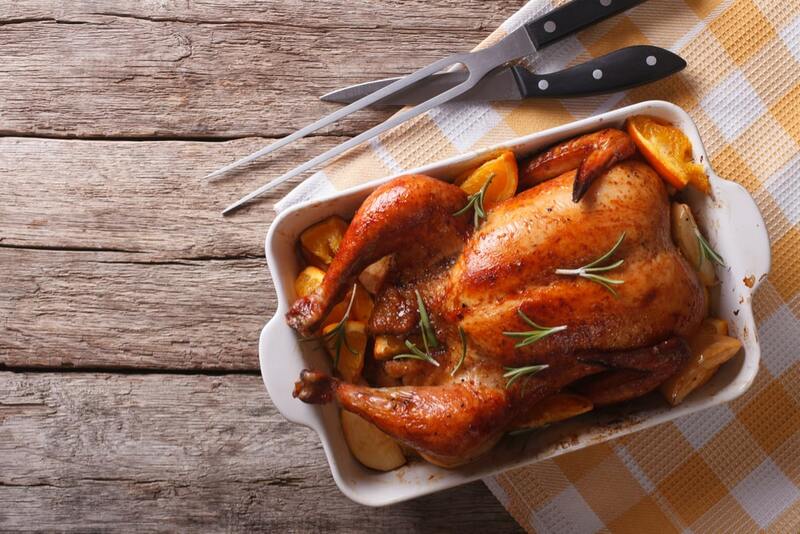 All you need for a flavorful turkey is a handful of fresh herbs, and, to the surprise of many, fresh fruits. Apple and orange slices add a juicy flavor that you’ll be craving all year long. Affordable garnishes paired with grocery store price comparison are the key to making sure you’re also paying the best price for your turkey this year. We’re going to skip the nasty bits about removing giblets. Instead, we’ll go straight to the yummy stuff. Stuff as much of the onion, orange, apple, rosemary, sage, and thyme into the cavity of the turkey as you can fit without it spilling out. Generously rub all surfaces of the turkey with olive oil, being sure to massage into the skin. Next, season the turkey liberally with salt and pepper. Before you place the turkey into the oven, insert a pop-up timer into the deepest part of the thigh. The turkey you purchased most likely came with one of these, but they can be purchased separately to ensure a perfect bake. Next, place the turkey in the center of the oven and cook until the internal temperature reaches 165 degrees (approximately 2-3 hours), or until the red stem of your timer pops up. Once done, delicately remove from the oven and cover with tin foil. For optimal juiciness, allow the turkey to rest for 20 minutes before slicing and serving. Give yourself enough time to thaw the turkey. Chances are the turkey you bought came completely frozen, and can take up to four days to thoroughly thaw in the fridge. Be sure to account for thawing time before the big day arrives. Don’t stuff the turkey with stuffing. Instead, add aromatic ingredients, such as citrus fruits, fresh herbs, and fresh produce. Cooking the turkey with the stuffing in the turkey means that you can unintentionally overcook the turkey by trying to cook the stuffing, or undercook the stuffing and not properly kill off the bacteria from the turkey (ew and EW). Let it be! If you want your turkey to be moist, don’t attempt to slice it right away. The high heat of the oven forces a majority of the turkey’s internal moisture into the center of the bird. Letting it rest allows for that moisture to redistribute. Alright, the dishes have cleared, napkins have been tossed like white flags on plates, and someone is asking for a hot cup of coffee. 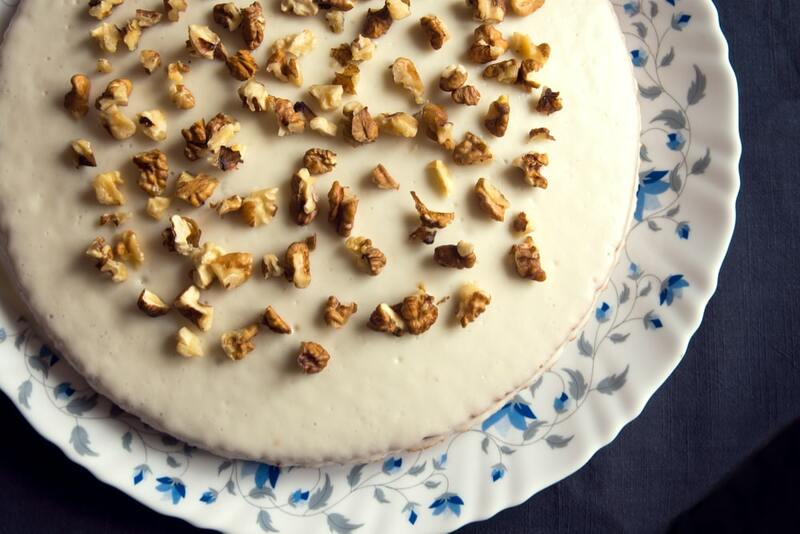 It’s about that time: dessert time. Remember those walnuts from your stuffing, and the pumpkin pie spice from your sweet potato casserole? Take those bad boys back out. Preheat the oven to 375°F and spray a 18 x 13-inch rimmed sheet pan with cooking spray. The cinnamon rolls will be easier to mold if the dough stands out for 10 minutes, so remove dough and place the icing back in the fridge for later. To begin, separate each can of dough into 8 rolls. Next, cut each roll in half as if you were cutting open a bagel, so that you have two thin rolls of the same diameter. Place slices in a single layer on the bottom of the pan, patting and pressing rolls to stretch onto the sides of the pan. In a large bowl, mix pumpkin pie spice, canned pumpkin, sugar, and eggs with 1 1/2 cups of whipping cream and 3/4 cup maple syrup. Blend well and pour over cinnamon roll crust. Once the oven preheats, bake for 33 to 38 minutes or until edges are a deep golden brown. Cool completely, leaving to sit for at least 1 hour and then refrigerating for an additional hour before cutting and serving. Beat the remaining 1 1/2 cups whipping cream with the cinnamon roll icing until well blended. Pour over the surface of the pie, topping with chopped walnuts. While any beverage goes delectably with this dish, we recommend a warm cider to complement the spice of the pie. Enjoy! Pro Tip: These seasonal recipe ingredients can vary in price depending on which grocers near you are running sales around the holiday. For optimal savings, be sure to utilize the Basket app to easily toggle between grocery store price comparison results for the list of ingredients you’ll need. When you sit down to dine this Thanksgiving, be sure to take a long look at those joining you for your meal. The turkey, the sides, and the dessert are all important, but it’s the company that will really make this Basket Budget Menu perfect. Happy Thanksgiving, from our Basket family to yours!